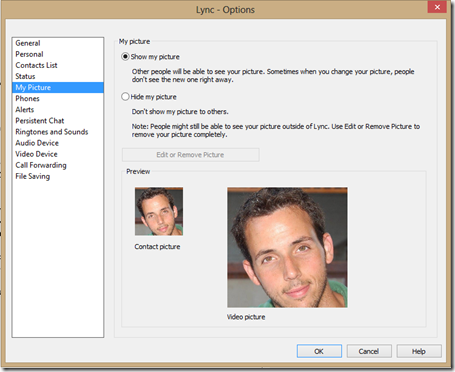 One of the new features in Lync 2013 is the use of high-resolution images with the integration of Lync 2013 together with Exchange 2013. With Lync 2010, we’ve been granted with the ability to add images to users by importing the images in Active Directory under the attribute ThumbnailPhoto or to display an image from a web link while this photo is available and accessible internally and externally. With Lync 2013, several changes were made in all aspects of image management and it now support images of size 648×648 instead of 96×96 as in Lync 2010. With Lync 2013 integration together with Exchange 2013, images are now stored under the user mailbox instead of in Active Directory and the Lync 2013 client shows them through Web Services requests. In order to import picture of users in Exchange 2013, we can simply do it by using the command Set-UserPhoto available from the Management Shell. For users who do not have integration with Exchange 2013 and their images reserved in Active Directory, Lync 2013 client will increase the saved images and displays them in a resolution of 278 × 278 (which means they look a bit blurry to other users who work with the new client). Another change that exists in Lync 2013 is that new users who want to display an image from a web link will not be able to do this in Lync 2013, unless it is done by them earlier in Lync 2010.